BOERNE, TX—Johns Crossing is to be located at the southeast corner of IH-10 and Johns Road, offering freeway access and visibility in a trade area experiencing double-digit growth in population and households. Johns Crossing is to be located at the southeast corner of IH-10 and Johns Road. BOERNE, TX—San Antonio’s retail market continues to benefit from the continued soundness of the metro area’s economy, which ranks as one of the better-performing major markets in Texas and the country, according to Weitzman. 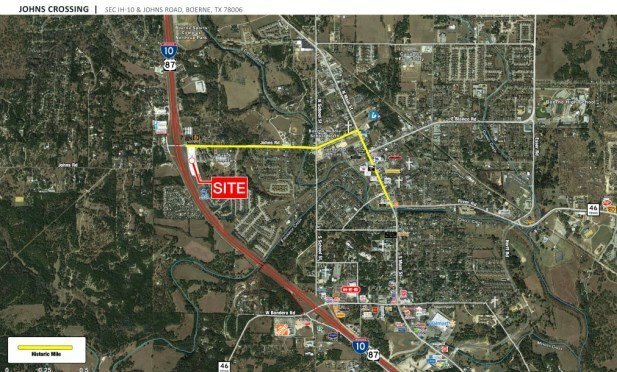 In one of the highest growth markets in the state, in the fast-growing San Antonio-area submarket of Boerne, a planned retail center, Johns Crossing, is to be located at the southeast corner of IH-10 and Johns Road. The location offers freeway access and visibility in a trade area experiencing double-digit growth in population and households.